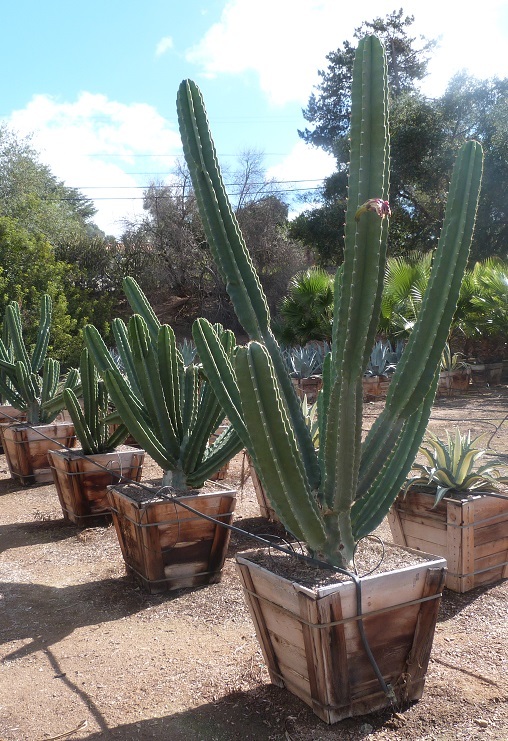 Often called the Peruvian apple cactus Cereus repandus, or Cereus peruvianus, is a large, upright thorny cactus that puts up columnar shoots growing to 30-feet tall. While plants can reach this height in the wild, they’re often much shorter in urban cultivation or in containers. Their beautiful sculptural shape creates drama in the landscape. Foliage color is a bluish green, which contrasts nicely to the showy white flowers produced in summer. Plants typically don’t start blooming until they are fairly large. Each flower opens for one night only, then dies. Flowers are followed by the most intriguing feature of this cactus: The fruit. Plants produce apple-sized fruits with a bright purple to red colored skin once ripe. When fully ripe, the skin will often split. If you’ve grown dragon fruit, you’ll be familiar with the appearance of the fruit. The inner white flesh is dotted with tiny black seeds, which are also edible. Fruit has a fresh sweet flavor. Not technically from Peru, plants are naturally found in rocky outcrops of South America. Plants are spiny, so take care when handling and when placing in landscapes that may have public traffic or children. Plants should be grown in a full sun location only and will not tolerate heavy wet soils, as they are prone to root rot under these conditions.